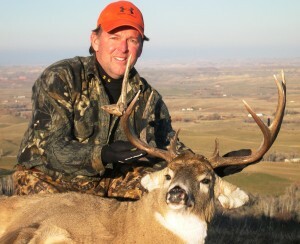 This is me with a great buck I shot out in Wyoming years ago. Minutes earlier I didn’t have that nice smile on my face. I was dazed, confused and damn lucky I hadn’t blown myself up. It started when I shot a foot over the buck at a tad under 200 yards with solid shooting sticks. Even when I miss a deer, it’s not by that much. The deer bolted at the bang and ran straight toward me! I bolted another 130-grainer, fired, missed again. The buck kept churning closer and closer, and I dropped him at 60 steps. Like I said, damn lucky. As I sat muttering and wondering what had gone wrong, I happened to look down at the barrel tip of my .270. It was split an inch! This was a $3,000-plus custom rifle so I’m assuming no manufacturing/metallurgical problem. (Yes, that’s a lot of cash for a deer rifle, and yes I got a sweetheart writer’s deal, and yes I did have to chip in more than a month’s mortgage for it, I swear). I figure that as I belly-crawled commando-style on an 8-pointer that I passed up the previous afternoon on that hunt, I slid the barrel too deeply along the ground and into the soft, sandy dirt and plugged the muzzle. The first bullet cracked the muzzle tip and who knows where that one and the second bullet flew. It was a miracle I got the buck—and didn’t get hurt. Lesson learned: I always tape the muzzle of my rifle when hunting in the snow, and you probably do too. But now I cover it with tape all the time and regardless of the weather when still-hunting and stalking, whenever I might have to crawl on a buck, or go prone in the dirt for a shot. 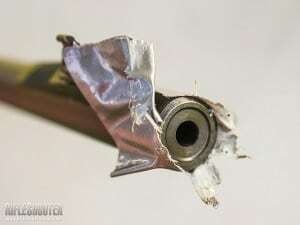 BTW, don’t buy the old rumor that electrical tape (what I use most often) or even heavier duct tape on the muzzle will affect your rifle and bullet’s accuracy and point of impact. It won’t! Common sense and testing here and here say any caliber bullet will blow right through tape. Tape the rifle muzzle when hunting in the snow, sand and dirt—also when it’s raining to keep out water and prevent barrel rust. This entry was posted in Big Bucks, Big Deer TV, Deer Guns & Loads, Deer Hunting by admin. Bookmark the permalink. On a trip a few years ago I noticed a mud wasp landing on my pals rifle barrel and crawling into it…it made a dozen trips in as many minutes. We checked the barrel with the bolt pulled out and could not see daylight while looking up at Sun. Took almost a hour to clear the packed mud nest with a cleaning rod. Can only imagine what would have happened had he shot it.